Shown $64.99Plants are designed to be delivered as close to the arrangement pictured as possible. Deluxe $74.99Plants are designed to be delivered as close to the arrangement pictured as possible. 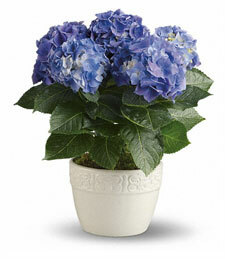 Blooming blue flowers burst to life from this stylish ceramic planter. A soft cloud of full, vibrant hydrangea, this arrangement is sure to make their heart soar towards the heavens!